This morning we had a series of earthquakes along the Aleutian trench near Atka and the Amlia fracture zone. This is a very active part of this plate boundary and I summarize some of this below. The USGS has a great review of the tectonics of the Aluetian Arc in an Open File report here. Below is my interpretive map where I use Google Earth and the kml (keyhole markup language) files from the USGS to plot epicenters, Modified Mercalli Intensity Scale (MMI) contours, and the subduction zone slab contours for this region (Hayes et al., 2012). I also place the USGS moment tensors for the two largest earthquakes (M 5.4 and M 6.3). The MMI is a qualitative measure of shaking intensity. More on the MMI scale can be found here and here. 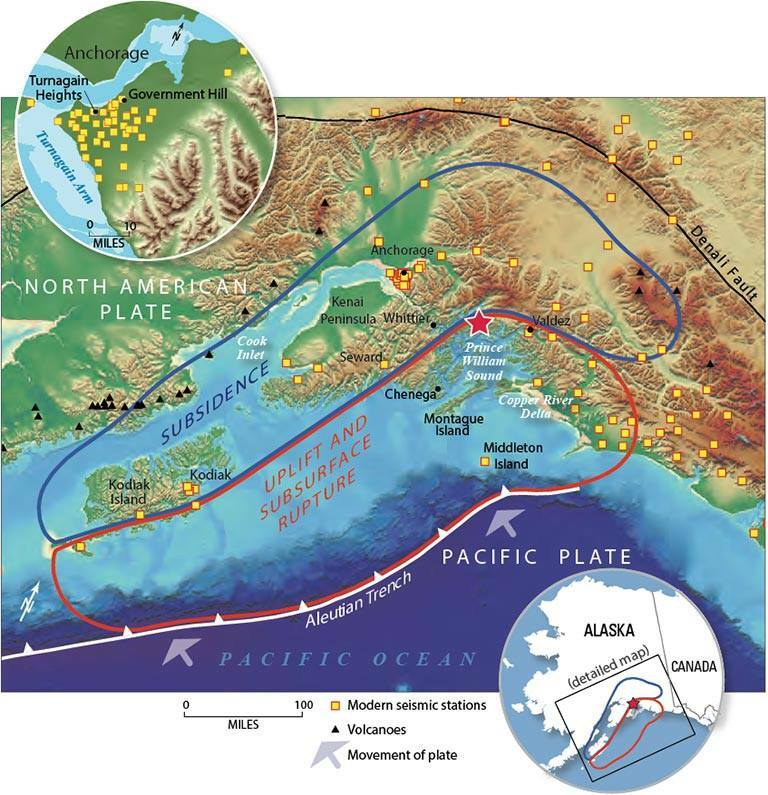 These earthquakes are the result of north-northwest compression from the subduction of the Pacific plate underneath the North America plate to the north. 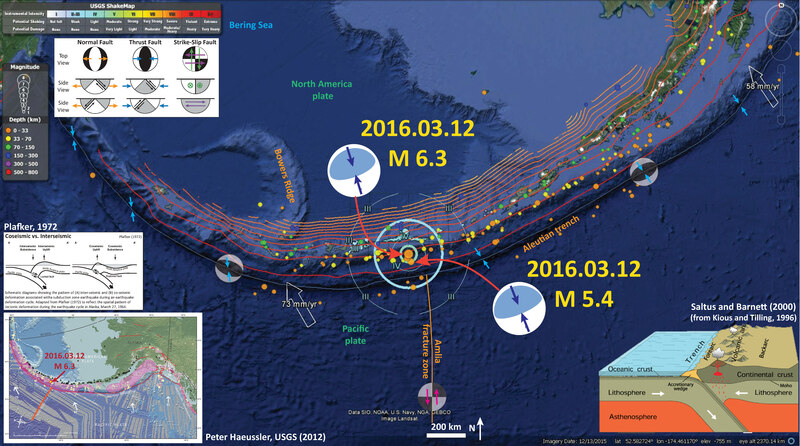 These earthquakes occurred in the region of the subduction zone west of where the Amlia fracture zone is aligned. 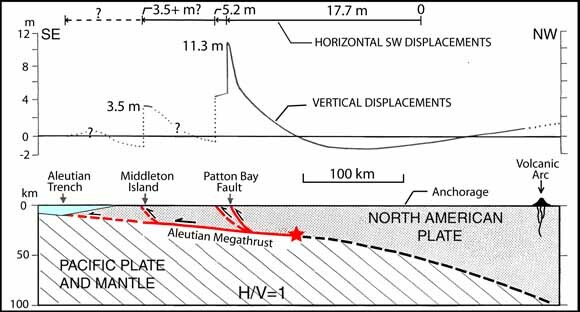 The AMZ is a left lateral strike slip oriented fracture zone, which displaces crust of unequal age, beneath the megathrust. The difference in age results in a variety of factors that may contribute to differences in fault stress across the fracture zone (buoyancy, thermal properties, etc). For example, older crust is colder and denser, so it sinks lower into the mantle and exerts a different tectonic force upon the overriding plate. The red-orange-yellow lines are slab contour lines from Hayes et al. (2012). These lines are a best estimate for the depth to the subduction zone fault. These are based largely upon seismicity and there is currently an effort to update these contours to integrate other data types. 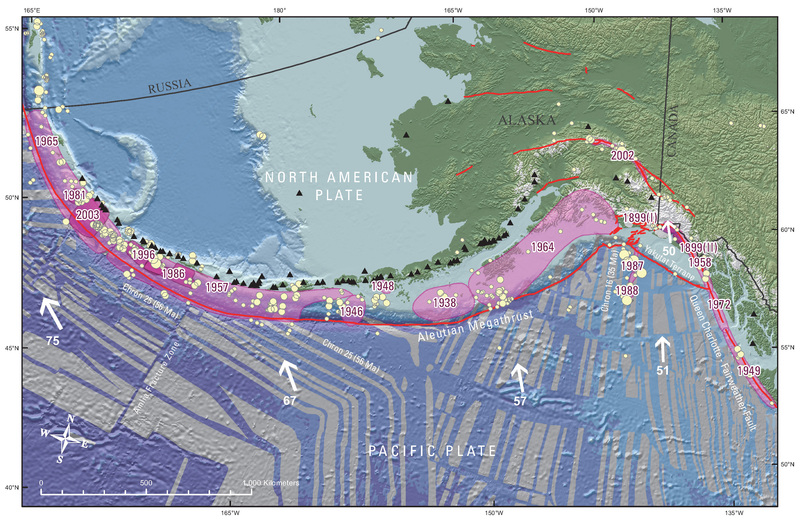 In the lower left corner, I place a map created by Peter Haeussler, USGS, which shows the historic earthquakes along the Alaska and Aleutian subduction zones. 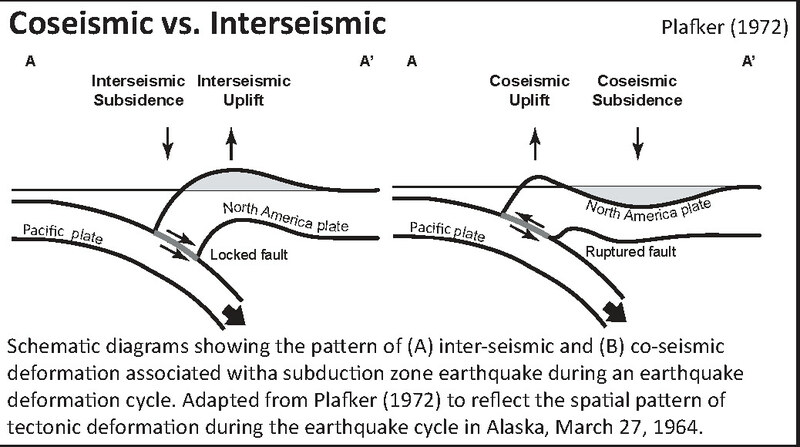 Above Hauessler’s map, I show a cross section of a subduction zone through the two main parts of the earthquake cycle. The interseismic part (in-between earthquakes) and the coseismic part (during earthquakes). This was developed by George Plafker and published in his 1972 paper on the Good Friday Earthquake. In July 2015, just to the east, there were some earthquakes near the Fox Islands. Here is my earthquake report for those earthquakes. Below is a map showing my interpretation. 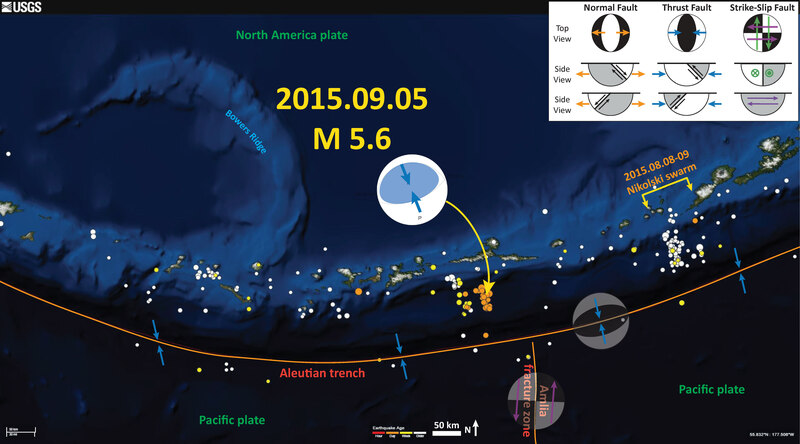 The region near the Amlia fracture zone was active in September of 2015 also. Here is my earthquake report from that series of earthquakes. 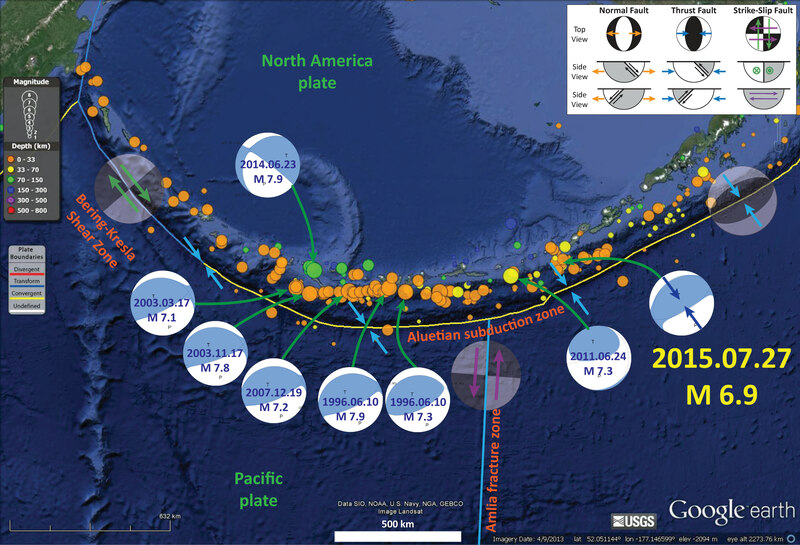 Below is a map from this 2015/09 report that shows some late 20th and early 21st century earthquakes and their moment tensors for this region of the Aleutian subduction zone. Shortly after, in November 2015, there was more activity in this region. Here is my summary report on those earthquakes. 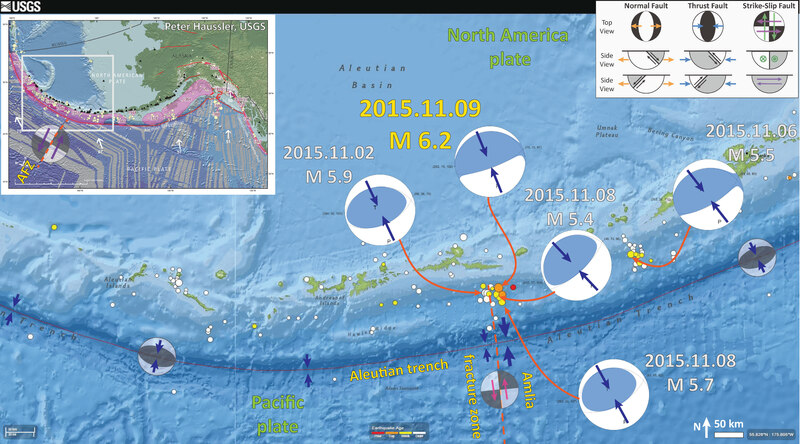 Below is a map that shows earthquake epicenters and moment tensors from November 2015. This map is particularly useful on its own. This is the map that shows historic earthquake slip regions as pink polygons (Peter Haeussler, USGS). Dr. Haeussler also plotted the magnetic anomalies (grey regions), the arc volcanoes (black diamonds), and the plate motion vectors (mm/yr, NAP vs PP).